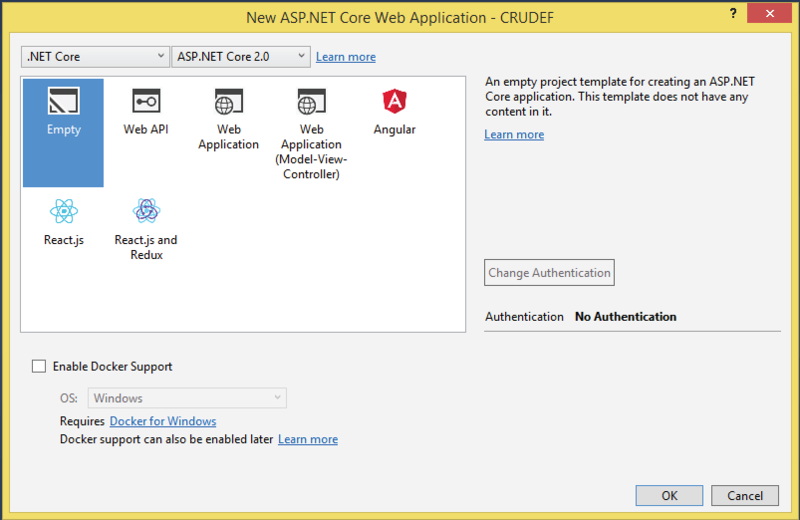 In this ASP.NET Core tutorial, you will learn to perform CRUD operations in Entity Framework Core from the very beginning. This tutorial will help you to learn Entity Framework Core so that you can start using it in your web application. This tutorial is made for everyone who wants to learn ASP.NET Core and Entity Framework Core quickly. All the things are explained in an easy & step-by-step manner. You can download the complete source code and run them in your PC. Here, I will perform the CRUD (CREATE, READ, UPDATE & DELETE) operations on a teachers table in the SQL Server database. This tutorial is divided into the following sections. In your Visual Studio, select ‘File > New Project’. A new window will open. On the left side, select ‘Installed > Visual C# > Web’. 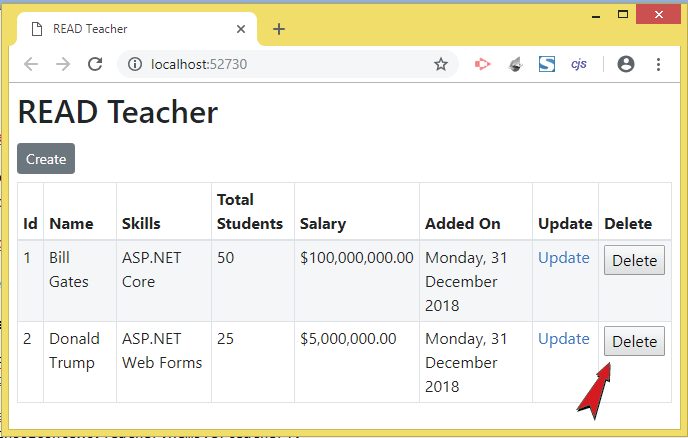 In the middle part, select ‘ASP.NET Core Web Application’. In the lower part, give your project a name as ‘CRUDEF’ or anything you want, and select the location on the drive where project files will be stored. Also, select the option – ‘Create directory for solution’ and finally click the ‘OK’ button to create your project. 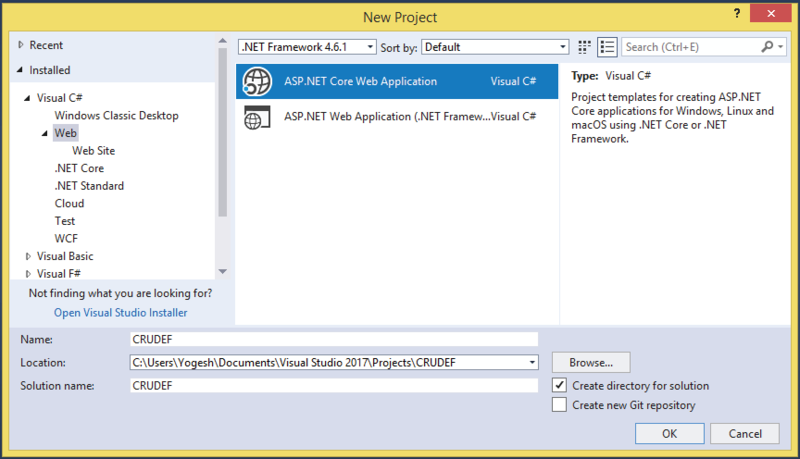 Next, a new window will open to ask you to select the project template, .NET framework, and a few more things. In this window, make sure you select these things. 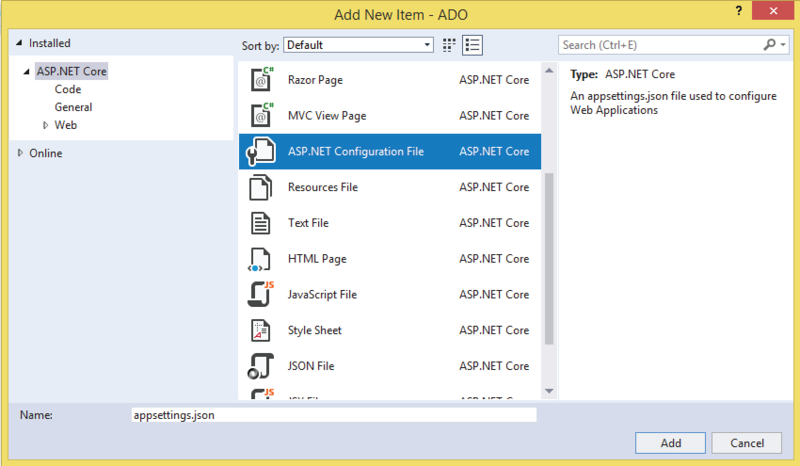 On the 2 drop-downs at the top, select ‘.NET Core’ and ‘ASP.NET Core 2.0. You can also select the ASP.NET Core version greater than 2.0. Select the ‘Empty’ project template. Your application should have the support of MVC framework, routing, and Static files. All this can be done from the ‘Startup.cs’ class which is located in the root of the application. If you want to go into absolute details of ASP.NET Core configuration, then kindly read Configuring Application in ASP.NET Core MVC. Create a ‘Views’ folder in the root of your project, and inside it, create a ‘Shared’ folder. Next, right-click on the ‘Shared’ folder and select ‘Add > New Item’. You will get a new window showing the item list. From this list, select ‘MVC View Layout Page’ and click the ‘Add’ button. This will add a _Layout.cshtml file in the Shared folder. The file will be open for editing. You need to add the following code to it. Next, download the Bootstrap Package and extract the Bootstrap zip file contents inside the ‘wwwroot > lib’ folder of your project. Bootstrap is used to create a responsive layout that is mobile friendly. Next, right click on the ‘Views’ folder and select ‘Add > New Item’. On the items list, select ‘MVC View Imports Page’ and click the ‘Add’ button. This will add a _ViewImports.cshtml file. In the same way, right-click the ‘Views’ folder and select ‘Add > New Item’. On the items list, select the ‘MVC View Start Page’ and click the ‘Add’ button. It tells that all the Views will have the Layout from the _Layout.cshtml file which is located inside the Shared folder. EF Core is an Object/Relational Mapping (O/RM) framework, an enhanced version of ADO.NET, which automates data storage and retrieval from the database. Go to Tools > NuGet Package Manager > Package Manager Console and execute the command PM> Install-Package Microsoft.EntityFrameworkCore.SqlServer. Go to Tools > NuGet Package Manager >Manage NuGet Packages for Solution, and search for Microsoft.EntityFrameworkCore.Tools. Once you get the result, install the first one. The installation of .NET CLI is done in a different manner. Right-click on the project name in the Solution Explorer and select Edit ‘CRUDEF.csproj’. The project file will open on the Visual Studio. You have to add the below lines to it and save. A Connection String stores the parameters to the database and is used to connect the application to it. These parameters are the name of the driver, Server name and Database name. It also contains security information such as user name and password needed for the database connection. The connection string is stored inside the appsettings.json file which resides in the root of the application. Right click on the project name in the Solution Explorer and select Add > New Item. Then when the ‘Add New Item’ window opens up, select ASP.NET Configuration file, and give it the name as appsettings.json (see below image). Finally, click the ‘Add’ button. I defined trusted Connection as true in the connection string so the Windows credentials of the current user are used to authenticate against the SQL Server. Right click on the project name in the Solutions Explorer and select ‘Add > New Folder’. Name this folder as ‘Models’. Then right click this ‘Models’ folder and select ‘Add > New Item’. This class has 6 properties for the 6 columns in the Teacher table in the database. I have applied the [Required] attributes on Id, Name, Skills, Salary and AddedOn properties, the TotalStudent property is applied with the [Range] attribute so it will only allow values from 5 to 50. Next, I will create the [SkillsValidate] custom validation attribute. So, create a new folder on the root of the application and name it as ‘CustomValidation’. Inside this folder, add a new class called ‘SkillsValidate.cs’ and add the following code to it. You now have to add Entity Framework Core DbContext file for defining your database and tables. So, create a new class called ‘SchoolContext.cs’ and add the following code to it. The class inherits from ‘DbContext’ class and defines a ‘DbSet’ of type Teacher. So, when migrations are run, the School database will be created along with the ‘Teacher’ table in it. Inside the ‘OnModelCreating()’ method I have specified the column types, max length and SQL types for these properties. Now, I have to add SchoolContext class as a service and also specify how it will get the connection string which is stored in the ‘appsettings.json’ file. I do this inside the Startup.cs class, so update its code too. Now right click the ‘(localdb)\MSSQLLocalDB’ node, in the SQL Server Object Explorer window, and select ‘Refresh’. You will see the School database is created. You can find this newly created table called ‘Teachers’ inside the ‘Tables’ node. Id – a primary key column that will be auto-generated from 1 since it is provided with Identity(1,1) attribute. Name – a varchar(50) column for storing the name of the teacher. Skills – for storing the skills of the teacher. TotalStudents – an Int column for storing the total number of students which a given teacher teaches. Salary – for storing the salary of the teacher. AddedOn – for storing the time of the creation of the record. The column has a Date type and is it automatically gets the current time using the GETDATE() SQL function. Note that all columns have NOT NULL attribute unchecked so they cannot contain NULL in them. Next, add the ‘Views’ folder in the root of the application. Inside this folder create a new folder called ‘Home’. 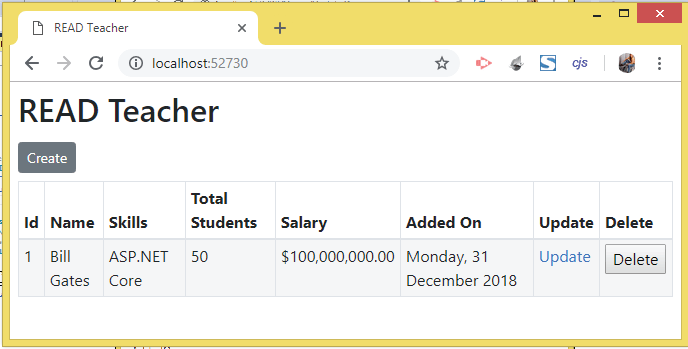 The View has a Model of type ‘Teacher’ and it creates Input fields for ‘Name, Skills, TotalStudents and Salary’, so that user can fill and submit it. 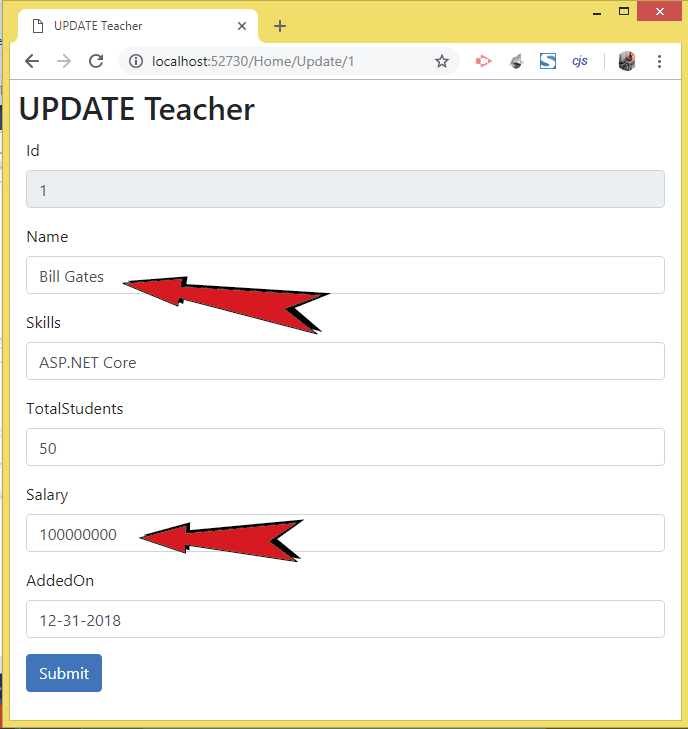 When the Submit button is clicked then the Create Action of type HttpPost, is called and the new teacher records is created. Run the application and in the browser go to the URL of ‘Create’ View, which is – http://localhost:52730/Home/Create. 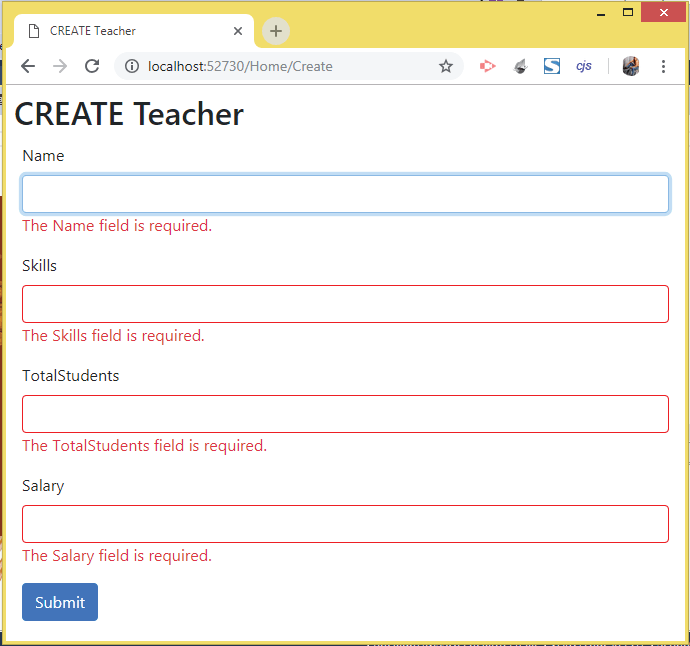 You will see the Create Teacher form in the browser. Without filling any fields press the Submit button and you will see the validation errors displayed by jQuery Validation plugins. Now fill all the fields (as shown by the below image) and click the submit button. The teacher record will be created in the database and you will be redirected to the Index View which is currently empty. You can confirm the record is inserted in the Teacher’s table. 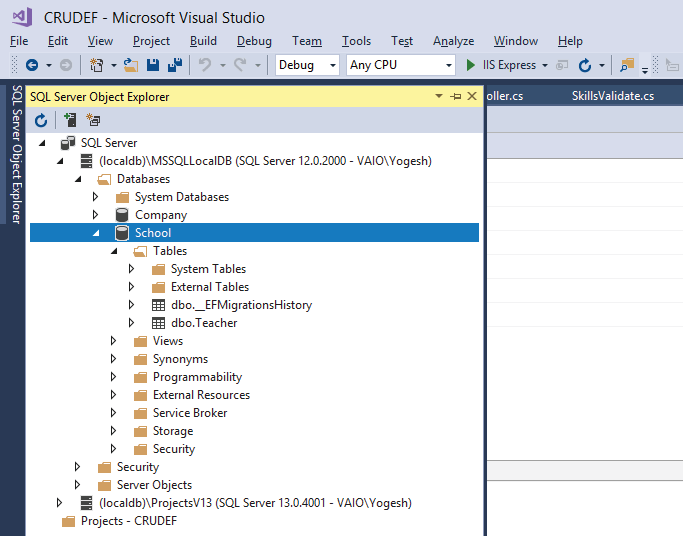 For this go to the ‘SQL Server Object Explorer’, then right click the ‘Teacher’ table and select ‘View Data’. 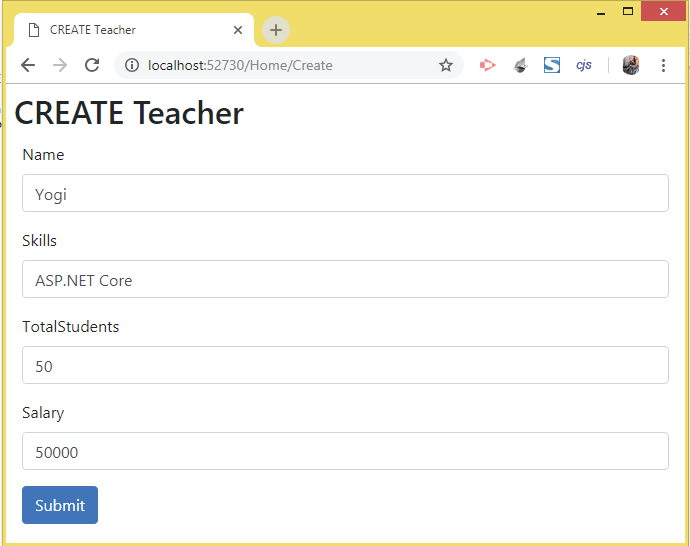 The code – 'schoolContext.Teacher' will get all the teachers entity from Entity Framework Core. We will create the Update and Delete Functionality in the next sections. The View is similar to the Index View we created earlier. I have made the ‘Id’ field as readonly so that user cannot change it. 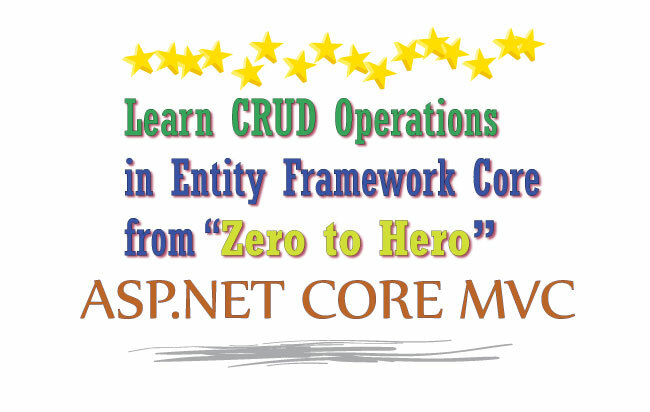 This completes this CRUD operations tutorial in ASP.NET Core and Entity Framework core. I hope you loved reading this and now understand how the codes are working. If you have any confusion go through all the Source Codes which you can download from this tutorial itself. Please like and share this tutorial on your Facebook and Twitter accounts and let your friends learn ASP.NET Core. It hardly takes a few seconds of your time.